Halloumi cheese, like other cheeses, belongs to the milk group in the MyPlate food guide. Halloumi cheese originated in Cyprus, and has been traditionally prepared with cow, goat or sheep milk. This cheese is very versatile and has the unusual feature of not melting when heated. For this reason, it can be grilled or fried, in addition to being eaten fresh with fruits or vegetables, or grated on pasta. 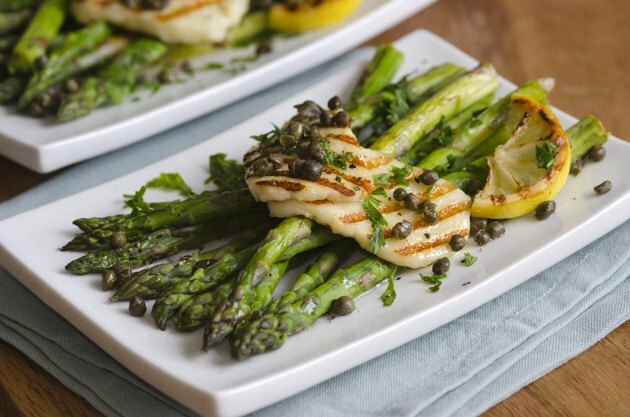 A 50-gram serving of halloumi cheese provides around 166 calories. One ounce of this tasty cheese provides about 90 calories. Reduced fat or light halloumi cheese can help you save on the calories; these varieties have 68 calories per ounce. Regular halloumi cheese has 7.5 g of total fat per 1 oz. serving. This corresponds to 12 percent of the daily value based on a 2,000 calorie diet. It also contains 4.5 g of unhealthy saturated fat. Halloumi cheese usually has about 25 percent milk fat. The reduced-fat version has 40 percent less fat and contains 15 percent milk fat. An ounce of light halloumi cheese provides only 4.5 g of total fat. Cheese is generally a good source of protein, and halloumi cheese is no exception. There are 6 g of protein in 1 oz. of regular halloumi cheese and slightly more, 8.1 g, in reduced-fat halloumi cheese. Cheese is usually high in sodium. An ounce of halloumi cheese has 330 mg of sodium. A high-sodium diet contributes to high blood pressure, and the Institute of Medicine recommends all men and women consume no more than 2,300 milligrams of sodium a day. Like most dairy products, halloumi cheese is a great source of calcium. A 1 oz. serving provides 20 percent of the daily value for this essential mineral for a 2,000-calorie diet. Halloumi cheese can be made with cow, sheep or goat milk. Other typical ingredients used are salt, mint and rennet.